Part of the St. Christopher's Hostel, but with a premium treat! Top quality accommodation at a budget price. Our two bedroom apartments offer one twin room and one double bed room, bathrooms, kitchen, living room and loads of space! Stay with friends or share and meet our other guests. Also available are two private apartment with double beds. The Rosa-Luxemburg-Strasse is one of the most fascinating in the city, featuring the Volksbhne (People's Stage) Theatre, the historic Babylon Cinema, and the former headquarters of the German Communist Party, as well as St Christopher's Berlin! The spacious ground level of the hostel includes a vibrant bar cafe serving food all day, a pool table on the balcony lounge, as well as plasma screens for all those live sporting events. The central location in historic Berlin-Mitte is tranquil, yet only a short walk from some of the hippest spots in the city, from fashionable shopping to bars, clubs and restaurants. A great base for your time in our wonderful city. The breakfast buffet costs €5 a day and is available every morning from 08:00 to 10:00. This can be found in the main lounge and consists of cereal, tea, coffee, toast, salami, cheese, and fruit. Belushi's Bar ! As in all St. Christopher's hostels, the bar is big, fun and lively. A great place to enjoy a few drinks, meet fellow travellers and have fun. We also offer great value food, ranging from bar snacks to our famous award winning Belushi's burgers. Additional services are available: bike rental, walking tours, internet access, board games, book exchange, etc. There is an open Wi-Fi access in the main lounge, so feel free to bring your laptop! As well as the apartments, you can also book our hostel, located in the same building, offering great value accommodation in dormitories or private rooms. Please look at the Hostels sections for Berlin. Everything worked well and all the staff was very nice. We stayed in an apartment which was in another entrance than the rest of the hostel but it was great. We had our own dorm and shared kitchen and bathroom with other guests. The apartment kitchen and facilities had everything one could ask for and everything was kept clean. Only thing was the shower where you could not yourself determine the heat of the water so it went from burning heat to ice cold back and forth. Otherwise all good. The hostel is actually in the same building as a big bar, so if you are looking to meeting new people, it's perfect for that. The atmosphere was great and our room was very clean. You can walk down to Alexander Platz no problem. It's a little bit further to the Brandenburg Gate, but still fairly central to everything you would want to see/do. I would likely stay here again in the future! I stayed in one of the apartments for two nights. The room was large and bright, as well as cozy. The room was also very clean and quiet. I did almost get burned in the shower when the water went from hot to hellfire without me m touching the known :o. All in all I had a great experience and would stay there again. Loved being in a separate apt away from the bar/ reception area. Had a great living space that we shared with two guys who apparently worked for the hostel chain. Nice couches/TV in den with big kitchen, two bathrooms for four people, key card access - I was sold. Belushi's Bar especially but also whole place feels very American, so if you're looking for a German boutique hostel don't come here. At 11am locals were drinking and watching rugby - an event that encapsulates the hostel's liveliness! The apartment was very clean and spacious. The location was great, most of the staff was nice and helpful, and there's a nice bar/restaurant. 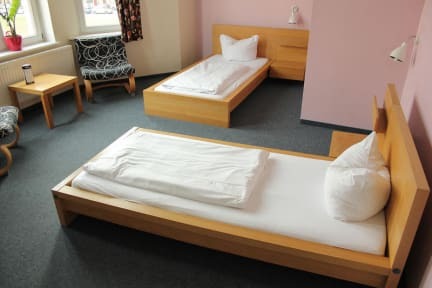 Definitely a good idea to get a shared apartment if you are sick of sharing hostel dorms with people and need some alone time. Definitely worth the $$$. Nice apartment with hob, microwave, fridge kettle. Right next to the Ubahn (u2). Note location details are incorrect.. Need to take the 142 bus from the train station.. Bar a bit too noisy and was very packed and not suitable for vegans. Lots of restaurants and bars close by. Stayed in very spacious top floor private aptmt. Breaky quite good. Liked the outside seating where you can have a drink and meet people. Helpful staff. Good location with underground train station right out the front which I found invaluable. They assist you in getting to several excellent walking tours on time. Can't really fault this place.